There is nothing worse than sweaty hands meeting a slippery racket (or racquet) during a game of tennis. If you want to be able to perform your best backhand or serve with confidence, then investing in the best tennis grips will help you stay on the ball at all times. What are the best tennis grips? If you play tennis regularly, then you may find that over time your racket begins to lose its grip. However, if you’re used to playing with that particular racket, there’s no reason why you should throw it out. Instead, investing in a tennis grip will put life back into your swing and could save you money on a brand new racket. If you find your palms sweat a lot, then a leather overgrip like the Tourna Overgrips are particularly good for playing in hotter climates. If it’s comfort you’re after, then a foam grip will allow you to focus all your energy on the game – try the Wilson Micro Dry Comfort Grip for no distractions during the match or the Babolat Pro Tour Grip if you’re training hard before a competition. Check out our full list below to find out what tennis grips are best for your racquet and playing style. Whatever type of player you are, this soft comfort grip makes playing tennis easy and stress-free. Suitable for all rackets, this tennis grip is designed to absorb sweat and moisture to make handling your racquet easy and comfortable. It’s a super thin layer that provides a barely-there feel so it won’t get in the way of any of your swings, serves or volleys. It’s said to be easy to apply to your racket and improves gameplay. If you get rather competitive during the game, then these gel grips are perfect for reducing impact and providing shock protection. The design allows your fingers to rest naturally and comfortably around the grip for total control during your swings. Users say it feels great and has great tack without feeling too sticky. This grip is recommended if your racket needs a complete replacement grip; be sure to remove current grip before applying the new one for the best results. If your palms get particularly sweaty, then this Hydrsorb grip will help you keep a grip on your racket even on the hottest of days. It’s also extra thick, providing cushioning that some other grips don’t have, meaning you can play for longer in comfort. You can expect minimal tackiness and a perfect fit from this replacement grip which should leave you free to swing and serve without a drop of sweat to distract you. This set of grips is ideal for all kinds of rackets from tennis to squash. They are separated into individual pieces so you don’t need to cut them to size, and users have said they can be reversed after use so you make the most of them. They are praised for their moisture absorption and are made from leather which make them soft to touch and easy to handle. They are said to stay smoother than rubber grips and don’t wear down as quickly as others. Ideal if you play frequently. 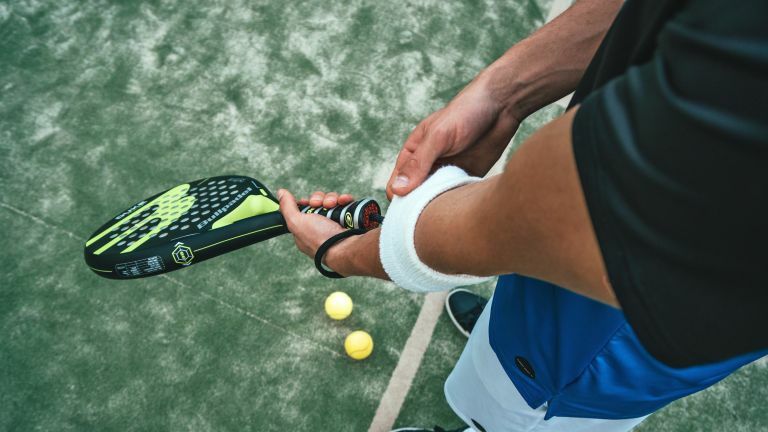 If you like to hit the courts often, then you’re going to need something with excellent grip and performance. These Pro Tour grips are perfect for anyone wanting to really get their training in as they are highly sweat and water resistant, as well as durable meaning they don’t give in to wear and tear easily. This pack of three will see you through with your favourite tennis racket or you can use them for multiple rackets depending on when or where you’re playing. The ideal grips for those who take their tennis seriously.